This 44-40 Winchester Center Fire ammunition is produced by Jamison Brass & Ammunition. Designed for use in revolvers or rifles, these rounds are loaded with 200 grain lead round nose, flat point bullets. The modest expansion of the RNFP bullets make this an excellent round for some practice time at the range, with your favorite cowboy action firearms. Pick up a few boxes today and feel the power of this legendary caliber! We don't have any reviews yet for this particular .44-40 WCF ammo from Jamison. 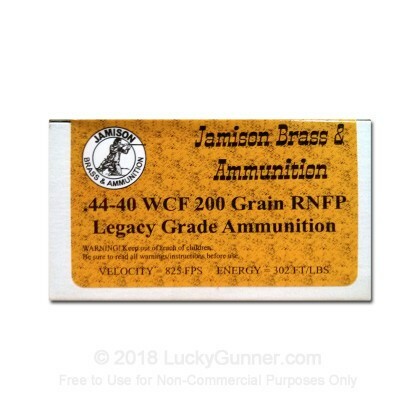 If you'd like to be the first to review this particular .44-40 WCF ammo from Jamison, fill out the form below.